Hippodrome, Blue Mosque, Hagia Sophia Museum & Underground Cistern! Great tour. Atakan is very personable. If you're a history buff this is your guy. He is EXTREMELY knowledgeable regarding Turkish history and all of the various sites. He also managed to bypass every line which is no easy feat. There were a million people out there! We had a great day with Atakan. He was very knowledgeable about the history of all of the sites that we visited as well as providing us with a brief summary of Turkey's history. He gave us ample time to take photos and was happy to answer any questions we had. He was very flexible throughout the day and provided insight to us about daily life in Turkey which we really appreciated. Highly recommend him - wish we had more time to spend. Atakan is an excellent guide. I booked him for an individual tour, and I liked what follows: . He picked me up at the hotel at the exact time . He had organized the day in his mind very well, with all the major attractions covered . He took me back to the hotel mid day as I forgot something, and restarted from where we lefted. Overall very professional and highly recommended. Great guide who is very knowledgable about the history of Turkey and Istanbul! We spent 3 wonderful days in Istanbul with Atakan. We booked a customized tour, and he planned each day so that we would experience and see the most we could during our visit. Atakan was highly knowledgeable about the history, art and culture of Istanbul. He also saw to it that we were comfortable and safe, and even brought us to the airport. We will be back to visit the rest of Turkey with Atakan! TOUR GUIDE RESPONSE: Thank you very much for the 5-Star review Ivona, it was a great pleasure for me to guide you and your lovely family in Istanbul. I whish you all the best and look forward to see you again. Atakan is a very professional tour guide with deep knowledge about all of Turkey, not just Istanbul. Atakan's commentary really enhanced our experience in the Old City and his experience allowed us to efficiently and enjoyably experience all of the major sites. He was very communicative and was always willing to answer questions, even after the tour ended, and to share his knowledge and connections to help us throughout our stay in Turkey. I highly recommend Atakan as a guide and would hire him again! Our Bosphorus cruise and visit to the Dolmabahca Palace was the second trip we took with Tours by Locals guide Atakan and built richly on the previous day's tour. What a fantastic way to experience Istanbul - on land and water - it gave a three dimensional experience of this fantastic city. We couldn't quite believe the history and beauty of the place and the warmth and vitality of its people. Both tours definitely enhanced a lively appreciation of the historic and contemporary Istanbul. What a fantastic experience it was to see the attractions of Istanbul with our Tours by Locals guide Atakan. It's been a month now since our visit and we are still talking about it. We are delighted at our good fortune in finding such an excellent local guide. We visited Sultanahmet and got a real feel for the history of the place thanks to Atakan's knowledge and appreciation of the area - the highlight was certainly Aya Sofya - an experience not to be missed. We highly recommend this tour. Atakan was very friendly & a great choice for my tour in Istanbul. If your in Istanbul, hes your guy for sightseeing. His knowledge about everything runs deep & his welcoming nature makes you feel very comfortable. Job well done. Thanks Atakan, until next time. An amazing day with Atakan, very knowledgeable and passionate about the history of his country. Well structured tour to suit our requirements. A terrific day for this Aussie couple, many thanks "Ata"
Day 2 of sightseeing, traveling with my mother and daughter, Atakan has really thought the best for all of us, he had special tour plans for all of us to enjoy! Atakan is very good with his English, and knowledgeable of any questions we had. He has really organized the tour very nicely for us to enjoy. We had the best two days with Atakan and will love to have him as our tour guide, if we go back again. Thank you Atakan for being such a wonderful tour guide, we loved every moment. will truly recommend! Traveling with my mother and daughter (3 generations) from Tokyo the first time in Istanbul, this was the best tour we have made. Atakan was a great tour guide, he was very knowledgable and explained everything in a way that all of understand. WE are so happy we had a tour with Atakan, and would love to do it again! Thank you Atakan for making our visit to Istanbul memorable. I cannot recommend Atakan enough! We had the most enjoyable and informative day which suited our exact needs. We asked for a particular type of experience and he met them exactly! Thank you Atakan! Atakan was everything we want in guide. He was considerate, knowledgeable, with good communication skills. We were very satisfied in all respects. What a great tour! Atakan is extremely knowledgeable of the area we toured (Istanbul) and was flexible on our schedule and changes "on the fly". Atakan is smart, energetic, engaging and keeps the tour at a fast pace. We got to see and learn about all of the items on our itinerary. We would definitely recommend Atakan to friends and relatives if the need arises. Atakan was a wonderful host. We had a blast and would recommend him for anyone visiting Istanbul. His English was perfect and we learned a ton about Istanbul history in the time we had with him. atakan was very thorough, patient and accommodating guide. he satisfied my curiosity concerning today's modern turkey as well as it's history. we toured at a nice comfortable pace. i would not hesitate to recommend atakan as your guide. Excellent private half day tour! It was fully customized, and we were able to see many great sites in a short period of time. He is also a licensed tour guide, so we were able to skip the line for all the sites. In the end, he also showed us a great place to buy Turkish delights (we asked for a place, it was definitely not a sales pitch), and it was fantastic... too bad I ate so much of it. Really recommend Atakan for tours in Istanbul. Excellent English, and very knowledgeable. Plus a lot of fun! TOUR GUIDE RESPONSE: Thank you..
My friend and myself had a most memorable three days in Cappadocia. The balloon ride was unforgettable. ATAKAN was our guide from tours by locals and we were very fortunate in this regard . 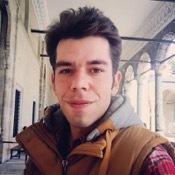 ATAKAN is a very professional and intelligent guide who is knowledgeable about a very wide range of topics - good news for tourists who are actually interested in Turkey, it's history, art and culture. In addition ATAKAN was always very considerate, punctual and well-mannered. Well Done ToursByLocals. We had a most enjoyable day covering all the sites we wanted to visit and more. Thank you for a most memorable time in Istanbul. TOUR GUIDE RESPONSE: Thanks for your kind words Andrew, hope to see you and your family in Turkey again..
We would recommend Atakan for any tours in Turkey. He arrived on time, corresponded with us in advance and was very knowledgeable in all things Turkey. His English is very good and easy too understand. He was accomodating to our wishes (and occasional change of plans). Atakan does an amazing job with this tour. Walking down Istiklal street and side streets - seeing all the shops, restaurants, and clubs - was a fun, unique experience. He provided a lot of information about the history of Taksim Square, which helped me to understand the culture better. I highly recommend him! Atakan was great! He arrived promptly and was very efficient in getting between the sites despite time constraints. He has wonderful English proficiency. He gave thorough information about the Palace that would have been missed with the group tour. He described the sites and cultural influences as we traveled down the Bosphorus, really bringing the history to life. I highly recommend him! Atakan is a fantastic guide. He possesses a national license, has very strong English skills and is very knowledgeable, with years of training and experience. He put together a great customized tour that maximized our short time (2 half days and 1 full) in Istanbul, Turkey. His tours were interesting and focused on the history and culture of his fabulous country. He arranged excellent drivers for us. He exposed us to the people, their customs, & local foods. My wife and I always felt safe & in good hands. TOUR GUIDE RESPONSE: Hi again Carl, thank you very much for your kind words and nice comments. It's very kind of you and I really appreciate it. It was a great pleasure for me to guide you in Istanbul and I'm glad to hear that you enjoyed your time with me. Please don't forget that you have a friend in Istanbul and you are always welcome if you plan to come back. All the best to you..
Our guide Atakan has found the perfect balance between cultural richness and entertainment. The walk was carefully managed, brilliantly commented visits of museums, mosques, public places and hidden treasures were interspersed by well needed coffee and lunch breaks. We learned a lot about Istambul historical background, its culture, religion, traditions and practices. Atakan was constantly adapting to our interests and reactions, his talks were detailed but never too heavy, often funny. Thank you ! Atakan was a perfect guide. We totally fell in love with Istanbul thanks to him. He new all the answers to our questions and was very flexible with the route. I highly recommend this tour if it is your first time in Istambul. And even if it not I am sure you will learn a lot from Atakan. TOUR GUIDE RESPONSE: Thank you very much for your nice words Anna, it was a great pleasure for me to guide you and your friends in Istanbul. As I promised I will write you if I come to your country one day. Knowledgable, friendly and engaging guide who also gave suggestions on activities for non-guided days in Istanbul. I would use him again without hesitation. The tour was incredible and unforgettable. Atakan did an exceptional work guiding us to the most interesting points of Istanbul; his knowledge about the city history is huge and I and my family learnt a lot. He is friendly, helpful, flexible and extremely kind. My eight year old son felt very confident with him. We was looking for a good guide and at the end we found a very good friend! Thank you Atakan for the excellent experience you gave us in Istanbul. I strongly recommend him to everyone! I am a relatively well traveled adventurous soul who booked an evening Beyoglu tour with Atakan on my 1st day. He was an excellent guide who picked up on my style and tastes almost immediately. In my experience, many guides do not believe that I am truly willing to try all sorts of foods and try to steer me away from things "Americans do not like." Atakan actually listened to me and led me to a lot of really delicious foods and taught me a lot about the social life of a local. 2 Thumbs Up! I would like to recommend Atakan highly as his knowledge on the history of Istanbul all the historical sites was bountiful . Aways pleasant , giving you plenty of your own time to see the sites . Excellent tour guide, very responsive in email communication with us, was on time, tailored the tour to our goals. Very enjoyable . Atakan served as our tour guide for Istanbul highlights. He was very caring, knowledgeable and provided great suggestions for local food and culture. Excellent English. He went beyond the call of duty catering to our needs. Would highly recommend him to anyone who wants to see this beautiful city. Having a private guide in this city was definitively a big plus and prize was very fair and reasonable. Atakan did an exceptional job guiding us and educating us on Istanbul. Our trip was just days after the bombing in Brussels. We were on edge. Once we met Atakan our fears went instantly away. His knowledge and his abilities to guide calmed us so that we could truly know about Istanbul, it's history, it's buildings and it's religions. We were picked up on time both days of our tour by an excellent driver with a huge van. We felt like royalty. We hope to do the same tour again. Atakan "Ata" met us promptly at the airport and he spent three days showing us his beautiful and historic city. He was prompt, personable, fluent in English, knowledgeable of Turkish history, culture and politics when we finished we had learned so much about Turkey's past and present role in the world events. Ata's flexibility in setting up a personalized tour for us, maximized our time in Istanbul. We were very fortunate to have Ata as our guide and would strongly recommend him as a tour guide. We asked Atakan rather late in the game if he could help us obtain tickets to the Whirling Dervish show. He took care of everything - from the tickets to arranging for transportation (with an excellent driver) from and to our hotel. We had already used him for a customized tour with minivan, and he is really terrific - knowledgeable, helpful, and thorough. Highly recommend. Atakan is a masterful tour guide. We booked him for the day following a cruise that ended in Istanbul, but we had a fairly unstructured itinerary that far exceeded our available time. Atakan met us at the pier (along with a superb driver), and listened to our ideas, but provided terrific guidance and suggestions. Due to his excellent advice, we were able to cover an amazing amount of ground, and his knowledgeable commentary provided real insights into Turkish history and culture. Highly recommend him! Atakan gave a great tour experience - he added wonderful historical context and stories to each of the places we saw. He really added something special to my visit and am so glad I took the step and booked his services. My wife and I had already seen many of the "top" sights in Istanbul so we wanted a guide who would tailor a two day walking/public transportation tour that would show us how people lived. Atakan put together a wonderful insiders' look at the city including local restaurants and coffee shops. He was friendly and very knowledgeable. We learned a lot from him and highly recommend him - if you choose him, be sure and ask about "katmer". Our guide was knowledgeable and friendly. He really "knew the ropes" to see everything and the right timing to avoid the crowds at each stop. We made use of the tram, which was a terrific way to avoid the parking dilemma that plagues Istanbul. The use of a private guide is far superior to talking a shore excursion group tour and the cost differential is very modest. Pleasant, very knowledgable, easy to talk to, prompt, helpful and caring. We enjoyed our tour with Atakan. He showed up early, paid our way on the Tram, was very professional and very informative. If he was asked a question to which there was no real answer, he was good enough to say that it was his opinion or belief. He is very knowledgeable and answered questions not related to the tour; e.g. location of good restaurants. I would use Atakan again when I'm back in Turkey, as I hope to return next year. We truly did feel like VIP's for our tour of Istanbul. We met Atakan at our hotel in the morning and when we got into the minibus we discussed with him what we wanted to do. He saw to it that we did what we wanted and then some. We had an exceptional time that day. Atakan is knowledgeable of the history and layout of Istanbul and we were able to purchase unique treasures from a ceramic pottery store. Lunch was amazing at a place he frequented. We were just so pleased with him and his attention to detail. Knowledgeable, friendly, accommodating, interested in pleasing us. We were looking for a good experience -- got a great experience. We recommend Atakan highly. Atakan is such a personable and knowledgeable guide. My daughter and I felt very comfortable and learned so much about Istanbul and the sights we saw. The pace was great for me (58) and for my daughter (26). Best decision we made. Atakan is a fabulous guide for anyone wanting to EXPERIENCE Istanbul. We did the VIP tour with a party of 10 and he did an incredible job catering to everyone's wishes. He is extremely flexible, accommodating and commands great knowledge of his country. He is a master at navigating thru crowds so we weren't rushed at a site. He also managed to get front row tickets at the last minute for 6 of us to see the Whirling Dervish ceremony that evening. I would change my travel plans to use his services again. Atakan is an excellent guide. He has a vast knowledge of his country's history and was able to answer questions about politics and religion in an open, objective manner. He set the tour at a good pace that allowed us to see all we wanted but we could also add options if we wanted. This was our first experience with Tours By Locals and Atakan was an exceptional ambassador for the company. TOURSBYLOCALS RESPONSE: We're happy to receive excellent feedback from your first ToursByLocals experience! Hope to see you again soon. This was a great tour, given by an extremely well informed and entertaining guide. I would recommend the tour to anyone who has a whole day in Istanbul. Atakan was FABULOUS. His high star rating was spot on and actually exceeded our expectations. He was knowledgeable, energetic, and happy to accommodate our interests. We feel so lucky to have had him as a guide in Istanbul. We booked him for a second tour! My party of 10 all thoroughly enjoyed Atakan as a tour guide! He arranged for a large, air-conditioned vehicle which comfortably accommodated our group. His vast knowledge of Istanbul allowed him to provide us with lots of interesting information both while driving between attractions, as well as when visiting each one. He was able to hold the interest of the three teenage boys in our group. He also selected a fabulous location for us to have a Turkish lunch - which was delicious! Highly recommended! My son and I enjoyed 2 wonderful days in Istanbul with Atakan. He was very informative, active, helpful, knowledgeable, flexible, and protective of our time. We had a day and a half with Atakan in istanbul in July. Having given him a list of places we wished to visit that would have taken a week he worked out a perfect itinerary for us. We did lots of driving, some lovely walks through interesting places, and at all times Atakan was easy to chat to, informative and friendly. Definitely recommended. Atakan was very knowledgeable about the sites we visited in the Sultanahmet part of Istanbul. As a tour guide, he was also able to purchase tickets for us, so that we didn't have to wait in the long lines of the Hagia Sophia, Topkapi Palace, and other sites. We took the half day tour with him, which allowed us to see multiple sites. TOUR GUIDE RESPONSE: Thank you very much for your kind words Brian, it was a great pleasure for me to guide you. Hope to see you again and all the best for you..
Could not be any better. Truly the best tour we've had in all of Europe! Hes that good! TOUR GUIDE RESPONSE: Thank you very much for your comment and nice words Ryan, it was a great pleasure for me to guide you. Hope to see you again..
We had a great morning with Atakan, he was extremely knowledgeable about the sites we visited. He shared interesting facts and stories with us, and allowed plenty of time for us to wander around the sites and take photos. His English language was great, we had no problems at all understanding him. Fantastic. Atakan arrived promptly at 9.30am. He showed us how to use the public transport system and assisted us to credit our Istanbul card. We visited the Blue Mosque, Hagia Sophia, Topkaki Palace, Basilica Cistern. We were unable to visit the Bazar as it was a public Holiday for the end of Ramadan. Atakan's knowledge was incredible and he was very patient telling everything he knew about the sites and the history of Turkey. A fabulous day, great tour guide. Atakan, we're sure to recommend your tour. TOUR GUIDE RESPONSE: Thank you very much for your nice words Lorraine! It was a great pleasure for me to guide you and I really enjoyed the day with you. I will write you if I come to Australia one day..
Atakan was a great guide! Knew the city very well. He was able to customize the tour based on our interests and made sure we hit all the must see places! I would definitely recommend him! TOUR GUIDE RESPONSE: Thank you very much for your nice words Cristina, it was a great pleasure for me to guide you and your lovely family in Istanbul. I'm going to send you all the photos of you that I took during the tour. Hope to see you again and regards.. Excellent tour. Atakan showed us the sights with a short history that brought it to life. Excellent tor guide. Much appreciated. TOUR GUIDE RESPONSE: Thank you very much for your comment Stephen, it was nice to meet and guide you. Hope to see you again in Istanbul or somewhere else in the world..
Atakan planned a lovely day full of history and local color. He was very knowledgeable about all the sites he took us to see and provided a thoroughly enjoyable day. TOUR GUIDE RESPONSE: Thank you very much for your nice words Susan. It was a great pleasure for me to guide you and your lovely family in Istanbul. Hope to see you again..
Atakan was great. He connected with us several times prior to our tour to plan it and tailor it to us. We ran into an unexpected glitch the morning of our tour, and were in a different part of the city, about 20 minutes from our hotel where we were supposed to meet. He and the driver were nice enough to meet us at the alternate location at the last minute in order to save time, which we appreciated. Very knowledgeable and detailed in his explanation of things. Also very flexible. TOUR GUIDE RESPONSE: Thank you very much for your kind words Randy. I really enjoyed the day that we spent together and can't forget the waffle that we shared :) Say hi to Debra and don't forget your friend in Istanbul..
Atakan was a very knowledgeable and friendly young man. We enjoyed the tour day tour with him very much. He explained very well a culture and history of the people of Turkey ,about which we knew little. TOUR GUIDE RESPONSE: Thanks for your nice words Virginia, it was a great pleasure for me to guide you and your husband. I'm glad to hear that you enjoyed your time with me. Hope to see you again..
GREAT TOUR If your looking for something a bit different this is the tour for you. The tour takes you to the real Istanbul, Atakan showed us how the locals enjoy their dining and where they hang out. You will enjoy having coffee with locals and then Atakan takes you on a tour of the streets and finally ending with a great meal. There is a fair bit of walking involved and it is a late night, however, it is all worth it. You will thoroughly enjoy your night with Atakan, a tour not to be missed. Atakan met us at our hotel on 21 May 2015 and led us on an Istanbul Old-City Walking Tour. He managed his time very well to enable us to visit all of the major sights of the old city. Atakan's command of English is excellent, and he is quite knowledgeable about historical and contemporary Turkish culture. He is an excellent tour guide, and any tour taken with him would prove to be extremely rewarding. TOUR GUIDE RESPONSE: Thank you very much for your nice words Bohdan, it was a great pleasure for me to guide you and I really enjoyed the day with you. Hope to see you again in Istanbul..
Atakan is tops with his knowledge and sharing of information. English is quite good and willingness to discuss any topic was most generous. Eight hours is a long tour, but he pulled it off. Cannot get this tour for four people from the ship line, unless you want a bus and a crowd of fellows and an inability to be guided truly privately and with some ease in a sea of tourists. TOUR GUIDE RESPONSE: Thank you very much for your nice words Robert, I'm glad to hear that you enjoyed your tour. It was a very different experience for me to guide someone who visited my city 50 years ago, I also learnt too many things from you. Thank you very much for everything and hope to see you again..
TOUR GUIDE RESPONSE: Thank you very much for your rating Werner, it was a great pleasure for me to guide you and your lovely family in Istanbul. I sent you a picture of your daughter that I took during the tour, I hope you got it. All the best for you and your family..
Atakan was an awesome guide for our family. He was so knowledgable about all the sites we visited in Instanbul. He also helped us pack in as much as we could in our one day in Instanbul and made great recommendation on what to see during our visit. The cistern was a family favorite! He also took us to a great shop to pick up some authentic turkish delight, which is so delicious. Thanks for a wonderful day Atakan, our family really appreciated it!!! We would hgihly recommend Atakan as a guide in Instanbul! TOUR GUIDE RESPONSE: Thank you very much for your rating and nice words Melissa. I'm glad to hear that you enjoyed your tour with me. Although you had a very limited time I did try to do my best one to show you as much as possible and I couldn't do that without your help. Thank you for everything and hope to see you again..
TOUR GUIDE RESPONSE: Thank you very much for your rating Roland, it was a great pleasure for me to guide you in Istanbul. Hope to see you again..
TOUR GUIDE RESPONSE: Thank you very much for your kind words Judith, it was a great pleasure for me to guide you in Istanbul. Please don't forget that you have a friend here. All the best for you.. Despite the unbelievable crowds during the first weekend in May, Atakan made sure we saw the main highlights during our visit to Istanbul. We enjoyed meeting him and found his commentary to be useful and interesting. TOUR GUIDE RESPONSE: Thank you very much for your nice comments Linda, I really enjoyed my time with you. Yes it was very busy in those days but we did good and I couldn't do that without your help. Thank you for everything and hope to see you again..
Atakhan is friendly, punctual, accommodating and highly knowledgeable. My wife and I thoroughly enjoyed our walking tour of Istanbul and would recommend him to anyone. TOUR GUIDE RESPONSE: Thank you very much for your nice words Gregory, I enjoyed the day that we spent together. Please don't forget that you have a friend in Istanbul. All the best for you..
TOUR GUIDE RESPONSE: Thank you very much for your rating and nice comments Alan. It was a great pleasure for me to guide you and I'm glad to hear that you enjoyed it. Hope to see you again.. The ship was in Istanbul overnight, so we used Atakan as our guide both days. He was punctual, informative, and flexible. Atakan helped us see as much as possible in 2 days without making us feel rushed. He's very friendly and gave us as much-or as little information about the sites as we asked for. The mosques were amazing, spice market delightful, grand bazaar overwhelming and lunch delicious! Atakan made our stay in Istanbul unforgettable! TOUR GUIDE RESPONSE: Dear Catherine! Thank you very much for your nice comments. It was a great pleasure for me to guide you and your group in Istanbul and I really enjoyed it. Hope to see you again..
Atakan was a superb guide. He is very knowledgeable, knows Istanbul comprehensively, taylors the itinerary to your interests, and puts no time limit on your day. He is pleasant, professional, and courteous. We recommend him highly. We spent 2 days with Atakan. He is a superb guide in all respects. We recommend him highly. Atakan was prompt, knowledgeable, flexible to requested changes in our itinerary. Our family had a wonderful day with him in the old city of Istanbul. Atakan was extremely knowledgeable and very helpful. We skipped past the long tourist lines, and he made our first day in the istanbul absolutely perfect. We are going to ask for Atakan again. Atakan was an excellent guide. We had been to Istanbul several times before but always did the obvious places. His job was to take us to the less traveled spots and also come up with a local place where we could get genuine Turkish food, which he did. He was very knowledgeable about the city for its history and culture and he did a super job updating us on current politics without being opinionated. Atakan's English was very good. This was a private tour in a van for five people in family. 5 stars! Great day with an experienced, guide who was happy to accommodate a specialized itenerary and work in a flexible manner. Istanbul is brimming with history and this guide helped peel back the cover. Fantastic tour of the city. Atakan is a great guide. Punctual, professional and very knowledgeable. I would highly recommend the tour but remember and bring your walking shoes! We were a group of 6 Canadian ladies - 5 over 60 and 1 in her 30s. We were apprehensive about touring Istanbul. Atakan made us feel very comfortable and safe as he showed us the beautiful city with pride. His commentary on the sites was perfect - very clear and concise with added points of interest.He met our individual needs, answered all our questions and constantly checked in as to what we wanted to do. I highly recommend Atakan as a very knowledgeable, professional guide.